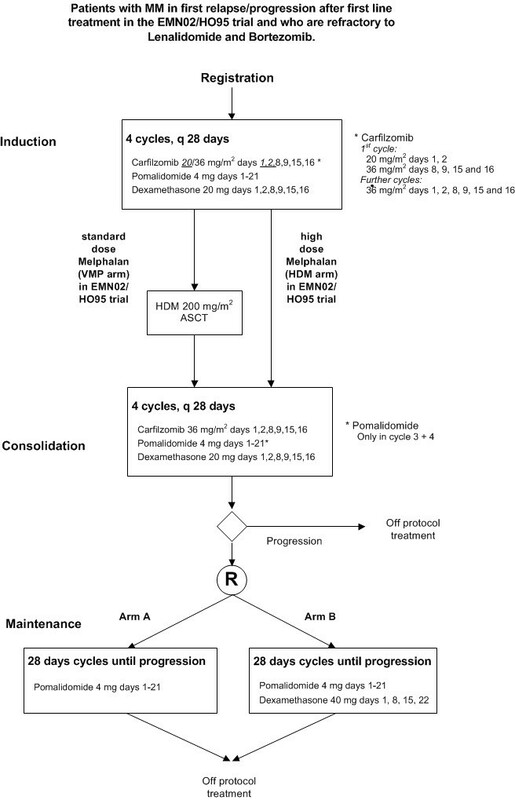 Pomalidomide combined with Carfilzomib and Dexamethasone (PCd) for induction and consolidation followed by Pomalidomide combined with Dexamethason vs Pomalidomide maintenance for patients with Multiple Myeloma in first relapse after prior 1st line treatment with Lenalidomide and Bortezomib. • Evaluate the efficacy defined as PFS of pomalidomide maintenance plus dexamethasone versus pomalidomide maintenance in patients who responded (≥ PR) to the combination of pomalidomide (POM), carfilzomib (CAR) and low dose dexamethasone (LD-DEX) for induction and consolidation. • Evaluate efficacy of the combination of pomalidomide (POM), carfilzomib (CAR) and low dose dexamethasone (LD-DEX) for induction and consolidation in subjects with relapsed or refractory multiple myeloma (MM) after prior first-line treatment in the EMN02/HO95 trial who are refractory to Lenalidomide and/or Bortezomib. This objective will be investigated in patients who have or have not received a prior autologous transplant. At least prior anti-myeloma regimen according to the EMN02/HO95 trial and documented progression or refractory multiple myeloma as per the IMWG uniform response criteria (Durie, 2006) during or after the last anti-myeloma regimen. Induction therapy followed by autologous stem cell transplant (AutoSCT) and consolidation/ maintenance will be considered as one regimen. Patients who have never achieved a response better than PD after at least 2 cycles of lenalidomide containing therapy or who progressed whilst on treatment.